Long wait: Multiple checkpoints and sometimes, hours of waiting for clearances are increasing logistics cost. 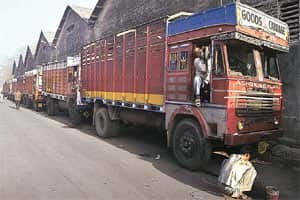 Mumbai: Despite a seemingly improving network of roads, around 60% of the time it takes a cargo truck to travel between key Indian cities is still spent idling at multiple checkpoints. Roads carry about 61% of the cargo and 85% of passenger traffic in the country and have long been seen as a major bottleneck in India’s rapid development. Take an example of a cargo-laden truck running from Delhi to Chennai, covering 2,310km across seven states. Drivers of major transport and logistics companies say the trip can be completed in 2.7 days but, instead, now takes, on average, 10 days, mostly on account of about 73 checkpoints throughout the route. And some of them can take 8-10 hours to clear. The checkpoints include stops related to forest, regional transport offices, entry tax, toll taxes, sales tax, octroi and value-added tax, or VAT. “I spent more time at check-points than driving," says Satpal Sanghwar, a 10-year veteran driver, who runs a 20-foot container trailer with Hyderabad-based transportation company DRS Group. “Out of these 73 checkpoints, 41 are toll tax checkpoints. India has 35 states and Union territories. Our interstate political borders are like international borders," says Pawan Jain, chairman and managing director of Delhi-based Safexpress Pvt. Ltd, which operates 3,000 trucks. “VAT is certainly a solution, but unfortunately most of the states have not implemented this." Brahm Dutt, secretary for ministry of road transport and highways, wasn’t available for comment. A senior road transport ministry official, who is not authorized to speak to media, concedes that multiple checkpoints are increasing the cost of logistics and those costs are usually passed on to the end-user. “Reducing the number of checkpoints is always in the agenda of the government, though it will take some time. This needs certain amendments to the existing laws. Once VAT is implemented by all states, the utilization of trucks can be increased," the official said. In terms of vehicle utilization, India reports an average rate of 6,000km per vehicle per month. The vehicle usage rate in the US is at 17,000km per vehicle per month, while in much of Europe it is 14,200. “A company will incur losses if the utilization rate goes below the 6,000km mark," says A.K. Agarwal, director for marketing with DRS Group, which owns leading package transportation brand Agarwal Packers & Movers. “Our utilization rate is 7,500km per vehicle per month while it could go beyond 10,000km if there is less number of checkpoints and better road conditions. I could have got better profits as well." The average revenue earned on a truck is Rs13.5-14 per km while containerized operators will fetch Rs17 a km. Noting that India is utilizing less than 50% of its trucks, Vijay Sankeshwar, chairman and managing director of VRL Logistics, which runs more than 2,700 vehicles, claims there is a toll tax checkpoint, on average, for every 50km of highways. “The cost of operations are shooting up," he says. “For instance, we used to pay Rs400 (per trip) four years ago in the Mumbai-Pune route, now we pay at least Rs9,600. It is likely to shoot up further to Rs13,000." India has a total of 65,536km of highways and 4,885km of expressways. Indian highways comprise around 2% of the road network, but they carry nearly 40% of the total traffic. India spends about Rs18,000 crore annually on road development. “You can complete a 250km Delhi-Jaipur trip in seven hours using the new highway," says DRS’ Agarwal. “The same distance, for example, in Madhya Pradesh will take at least 30 hours."